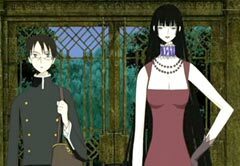 xxxHOLic is a world where you better be careful of what you wish for, because in Yuko's shop, you might not be able to afford it. "For your wish to be granted, there must be equal compensation. What important thing would you give up? Another person? Your soul? Your...?" Imagine if you could have your heart's desire. What would you wish for, and how much would you be willing to pay for it? Yuko Ichihara specializes in wishes, but nothing in this world is free, or in one of the many others for that matter. Yuko demands a fair payment. If you want something small, then the price might be an old highchair lying unused in your spare room, but if you want something huge, such as the ability to travel through dimensions, then it could cost you your most prized possession, or the memories of the person that you love most in the world. Enter Kimihiro Watanuki, your token Japanese teenager. I would use 'normal,' except that he's not. 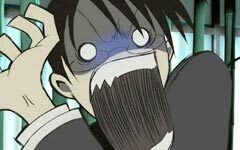 Watanuki can see spirits, and he is not happy about it. In fact, he's being stalked by one when he passes by Yuko's shop, touches the wall, and gets dragged inside. Yuko the Dimension Witch is very strange indeed. 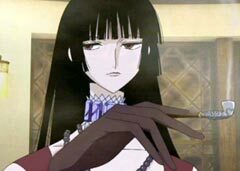 She smokes opium and she loves alcohol and all manners of food, particularly if Watanuki is the one cooking it. She has a habit of quoting the Kodansha dictionary ad nauseum. Two soulless servants help her to run the store, Morodashi and Marudashi. Both words mean in Japanese exposing yourself in public. After explaining that their meeting was hitsuzen or 'inevitable,' Yuko offers to help Watanuki to get rid of the ghosts in return for his assistance in her store as her cook, cleaner, and indentured slave for an unspecified amount of time. Thus begins his foray into her strange world. xxxHOLiC was announced around the same time as Tsubasa RESERVoir CHRoNiCLE, and it is still running in Kodansha's Young Magazine. It was licensed quickly by Del Rey, who have currently released five volumes of this on-going series. While the manga centers around Yuko, Watanuki and their clients, we also meet Watanuki's beloved Himawari-chan, and his rival for her affection, Shizuka Domeki. Like our protagonist, Domeki has some psychic abilities, but his powers lie in exorcising spirits using a bow and his skills as an archer. Himawari-chan provides brightness in an otherwise dark manga. 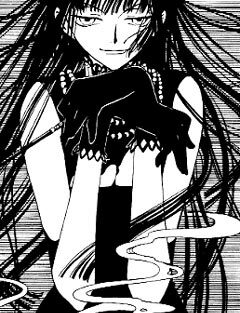 She seems to accept that both Watanuki and Domeki have psychic abilities, but as with other characters, CLAMP has chosen not to divulge too much about her past. The artwork is different from previous series. Panels are often white on black, with little or no shading, giving an overall darker feel to the scenes themselves. Yet the series can also be light-hearted, filled with in-jokes that fans of CLAMP will enjoy. 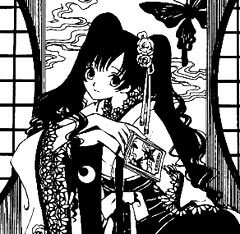 Additionally, xxxHOLiC teaches you a lot about Japanese culture, as many of the stories are themed around festivals, such as Obon or White Day. For enthusiasts of Japanese popular culture, Yuko's constant references to obscure television programs and popular manga is sure to teach your something that you never knew. Some chapters are simply mortality tales, following clients as they make mistakes or allowing their greed and bad habits to eat away at their souls. From a twin entangled in her sister's opinion of her, to the group of high school students summoning unpleasant beings in their spare time, the fables are engaging. Other chapters explore the supernatural side of Tokyo and the other invisible beings that live alongside humans. 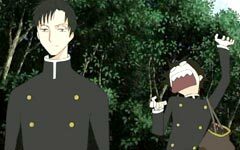 Some involve Watanuki running into people by accident, and in others, Yuko sends him out on tasks, either alone or with Domeki -- much to Watanuki's intense irritation. Throughout the story, many things are left open as to tempt the reader. Who exactly is Yuko? The name is an alias, but she speaks of other people in the CLAMP universe, including Subaru Sumeragi of Tokyo Babylon and X, and Clow Reed of Cardcaptor Sakura and Tsubasa RESERVoir CHRoNiCLE with a familiarity that suggests that she is much older than she looks. Yuko herself can either be a carefree spirit (especially when drunk), or solemn and serious, depending on the situation. Indeed, she appears almost omnipotent, more than aware that our dimension is only one of many thousand. She is very powerful, having used magic to create her child-like companions, Maru and Moro (Streaking and Flashing), as well as the Black and White Mokona Modoki (albeit with the assistance of Clow Reed). Perhaps these questions will be answered in future volumes. The series also gives a chance for cross-over fiends to spot references to other manga in CLAMP's universe. There are some obvious ones, such as the presence of Mokona Modoki of Magic Knight Rayearth, Yuko reminiscing about a 'creep' she knew long ago and his Cardcaptor descendent, or Watanuki running into Kazahaya Kudo and Rikuo Himura of Legal Drug while searching the Green Drugstore for something to cure Yuko's frequent hangovers. There are also easter eggs that are harder to find, such as the 'Where's Waldo'-like challenge of spotting a stuffed Kero-chan plush secreted in the back of Yuko's store, or Maru and Moro reading The City with no People from Chobits. While it was quickly announced that sister series Tsubasa RESERVior CHRoNiCLE was being made into an anime, fans were slightly disappointed to hear that xxxHOLiC would be made straight into a movie, despite the fact that there is more than enough content to adapt the manga into a television series. However, Yuko and Watanuki have made brief appearances in several episodes of Tsubasa Chronicle. Subtitled Manatsu no Yoru no Yume (Midsummer Night's Dream) and produced by Production I.G. (Ghost in the Shell: Innocence, Blood: The Last Vampire), the movie follows Yuko, Watanuki and Domeki in what appears to be an original story. 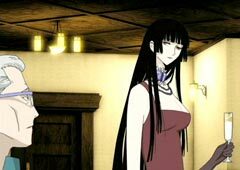 The plot is as follows: After receiving an anonymous letter inviting them to an auction, Yuko, Watanuki and Domeki meet seven other guests in a western-style mansion. None of those attending knows the identity of their host. Each of the other guests is there to complete their individual collections, but what exactly is being auctioned? The mansion itself is a strange place, filled with endless corridors, rooms filled with broken traffic lights, birdcages, chains and masks. It possesses a magic of its own, and when the collectors begin to disappear one after the other, Yuko is determined to get to the bottom of it. With the up-beat opening theme performed by J-pop artist Shikao Suga, and music by Tsuneyoshi Saito, the movie itself looks to be something that all CLAMP fans should keep an eye out for. xxxHOLiC: Manatsu no Yoru no Yume opened August 20th in Japanese movie theatres, along with the thirty-minute Tsubasa Chronicle movie, Tori Kago no Kuni no Himegumi (Princess of the Country of Birdcages). The opening theme, Sanagi by Shikao Suga is currently available as a CD single or as a limited edition CD/DVD. The soundtrack is also available now.